This brief tutorial describes how to view CPU temperature on Linux using lm_sensors. The Lm_sensors, short for Linux-monitoring sensors, is a free software that provides the necessary tools and drivers for monitoring CPU temperatures, voltage, humidity, and fans. It can also detect chassis intrusions. So, you can find out a defective hardware components, and replace it to avoid the system hanging or overheating issues. Lm_sensors comes pre-installed with most modern Linux operating systems. If it is not installed already, you can install it as shown below. The sensors-detect is a stand-alone program for detecting installed hardware and recommending specific modules to load. The “safe” answers are the defaults, so just hit to ENTER the accept the default values. It won’t cause any problems. This will create the /etc/conf.d/lm_sensors configuration file which is used by lm_sensors.service to automatically load kernel modules on boot. 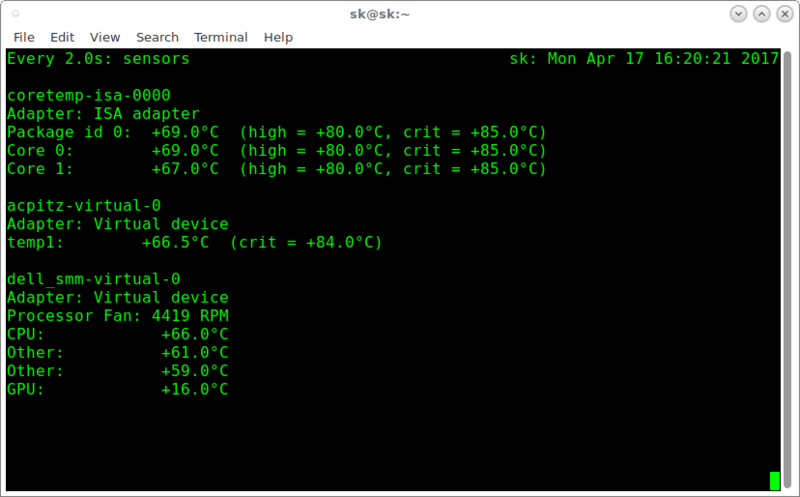 As you see in the above output, lm_sensors displays my CPU’s current temperature, high and critical temperature in the brackets. If you find out any of your hardware devices reaches high or critical temperature, you probably need to check that hardware device. To display the temperatures in degrees Fahrenheit instead of Celsius, use -f option. To monitor the CPU temperature in real time, you can use ‘watch’ command like below. Press CTRL+C to stop the monitoring at any time. And, that’s all. If you find this guide useful, please show your support by sharing it on your social and professional networks. Thanks for the post. This works just as you show on Debian 9.5! I am on Manjaro KDE and my machine is a Yoga laptop and I cant get the fan rpm to show up. I reinstalled lm_sensors but with the same result. My machine is not running hot but I need to be able to see fan speed. Also I am new to linux and really giving this a go and was seriously thinking of doing away with windows 10 all together but then I ran into this and before I delete windows I would like to make sure I have all the wrinkles out ya know. Your tutorials have been so much help to me. Thanks for the great work. @Josh F. : Your Yoga laptop (maybe) is not well supported by the lm_sensors package or it’s configuration. Did you find your sensors chip in the output of sensors-detect command? If answer is yes, then you have to tweak lm_sensors configuration. It is in the “/etc/sensors3.conf” . There should be a “sensors.d” folder in the same place. I think that by default this “sen*.d” is empty. You can copy “sensors3.conf” to this folder, rename it (but, prepend [add] a number before the rest of the name) to match your laptop. This is because, files in this folder are alphanumeric looked up by the lm_sensors package. You should google search for the right settings for your laptop. For that, I can’t help you. Thank you for your lengthy, yet descriptive and helpful comment, Jovan. Much appreciated.